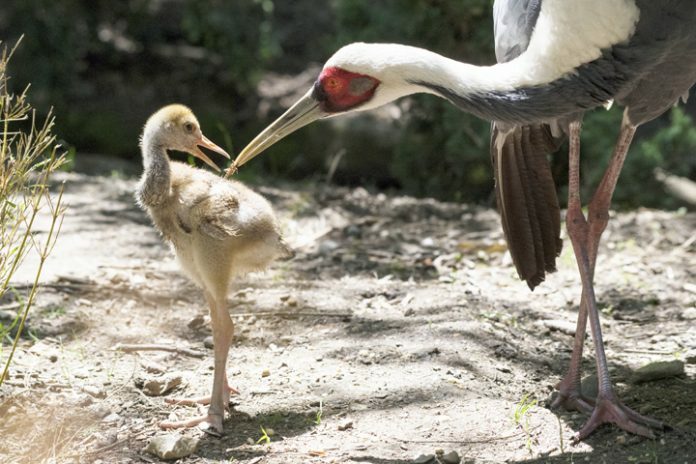 NEW YORK – A white-naped crane chick (Grus vipio) hatched at WCS’s (Wildlife Conservation Society) Central Park Zoo has made its public debut. The chick hatched on April 29 and is only the second of its species ever hatched at the Central Park Zoo. The adult cranes are experienced parents and this is their third offspring – their first chick was hatched at the Bronx Zoo in 2011; the second was hatched at Central Park Zoo in 2014. WCS breeds white-naped cranes as part of the Species Survival Plan (SSP), a cooperative breeding program designed to enhance the genetic viability of animal populations in zoos and aquariums accredited by the Association of Zoos and Aquariums. The species is exhibited and bred at both the Central Park Zoo and the Bronx Zoo. White-naped cranes are a migratory species native to East Asia including China, Russia, Japan, North and South Korea, and Mongolia. They are classified as “Vulnerable” by the International Union for Conservation of Nature (IUCN), with the wild population estimated to be between 5,500 and 6,500 individuals. The species is at risk because of loss of its wetland habitats to agriculture. The WCS Mongolia Program has identified this species as a conservation priority, and has conducted censuses in high elevation wetlands in Mongolia and nearby countries. WCS has worked with conservation partners and governments across the crane’s range to help conserve this iconic species. WCS (Wildlife Conservation Society) MISSION: WCS saves wildlife and wild places worldwide through science, conservation action, education, and inspiring people to value nature. To achieve our mission, WCS, based at the Bronx Zoo, harnesses the power of its Global Conservation Program in nearly 60 nations and in all the world’s oceans and its five wildlife parks in New York City, visited by 4 million people annually. WCS combines its expertise in the field, zoos, and aquarium to achieve its conservation mission.